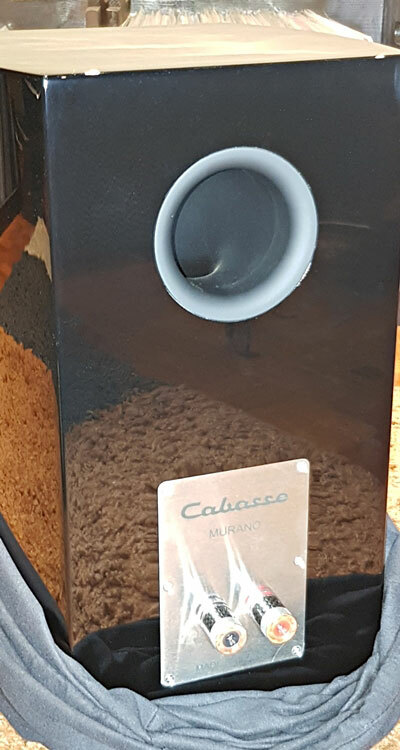 The Cabasse Murano speakers on review are on loan from MusicHaven. We returned it to them afterward and thank them for giving us this opportunity. To read more about speakers review on Headfonics you can click here. 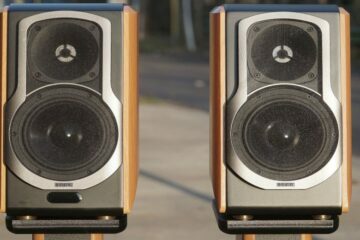 It is not every day that a pair of small loudspeakers catches one’s attention, and for all the right reasons. In my case, the Cabasse Murano certainly did. Founded by Frenchman Georges Cabasse, the company bearing his name has been making fine loudspeakers since the 1950s. They are among the few that make their own raw drivers, or the individual woofers, midranges, and tweeters in a loudspeaker. Cabasse specializes in coaxial drivers. The tweeter is right in front of and in line with the woofer. They are on the same axis; hence, they are “coaxial.” Its typical benefit is a wider sweet spot. Since the tweeter does not need its own mounting space, a smaller cabinet can be used. In fact, Cabasse’s flagship loudspeaker, the large and unique La Sphère, has no cabinet at all. It literally is a giant ball on an elaborate metal stand. It features four coaxial drivers. A massive 22-inch dome, (not a cone), woofer takes up its entire visible façade. Its center is indented to fit an 8-inch annular woofer, and then a 4.5-inch diameter annular and a 1.1-inch dome tweeter. The drivers are shaped so that the La Sphère’s side profile remains that of a sphere. 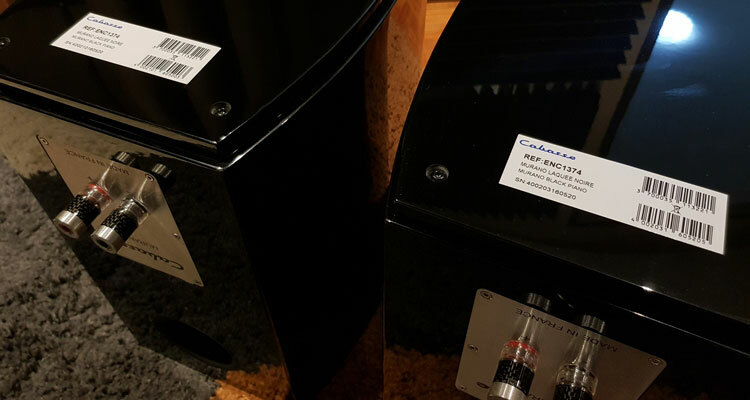 Before we go on, let us take a closer look at the differences between coaxial drivers and their close relative, the concentric driver. Concentric drivers share the same center. 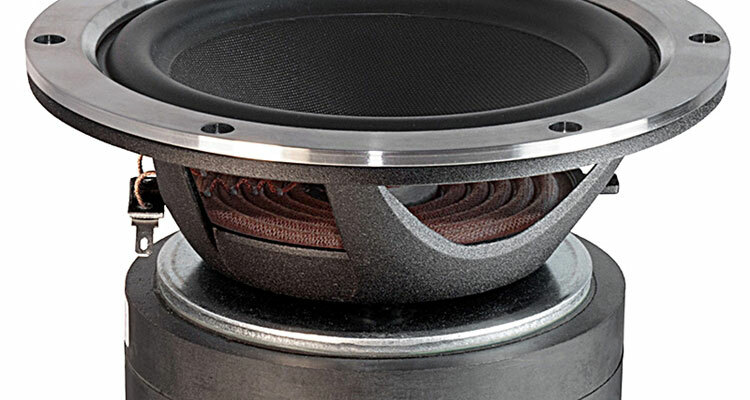 The tweeter is physically inside the voice coil of the woofer, roughly at its acoustic center. This aligns the points where the sound originates and brings about two major benefits. First, the sound from both drivers will arrive at the ear at the same time, improving coherence. Second, it may sound as if one very good driver is doing the job of two. “May,” because the woofer cone unavoidably acts as a horn for the tweeter at its apex, causing a type coloration known as “horn honk.” Imagine the voice of a tour guide over a portable megaphone. It is louder, but it takes on a distinct muddy and shouty character. That’s horn honk. Fortunately, British manufacturers Tannoy and KEF have figured this out this long ago. 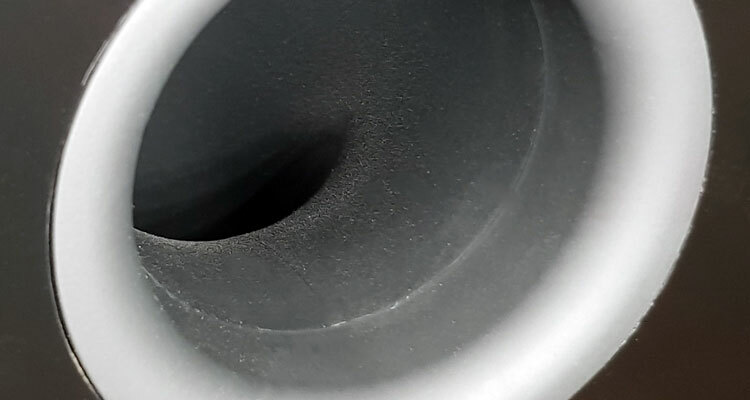 With decades of experience, they know precisely how to shape the cones of their woofers to help rather than harm the sound of the tweeter within. In fact, their best sounding and most highly rated loudspeakers feature concentric drivers. Coaxial drivers, on the other hand, share the same axis but not the same center. The tweeter is physically in front of the woofer, as is common in car speakers. One can argue that this will not be ideal since the sound from the tweeter will arrive at the listener’s ears slightly ahead of the sound from the woofer. As it turns out, this is not an issue with the Cabasse Murano. More on this later. 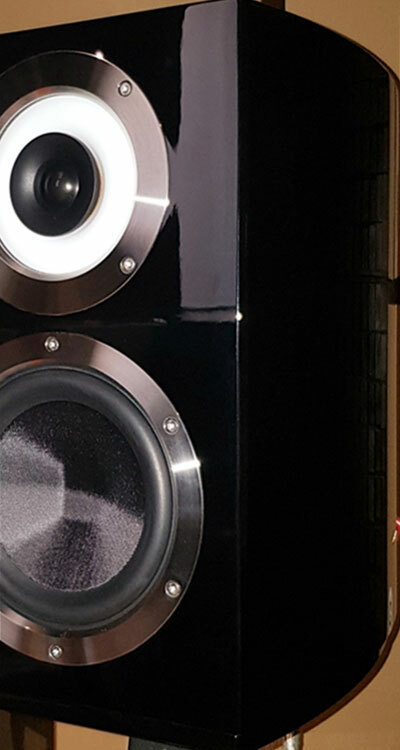 So, what are the Cabasse Murano speakers? They are a pair of three-way ported bookshelf speakers that exude extreme quality and fine artisanship. They are hand-made in France, and according to the vendor, cost roughly US$3,400 a pair in my area. A bit expensive for bookshelf speakers, but there are many that cost even more. Its bigger brother, the Murano Alto, is a floor-standing model with the same basic shape and appearance. That is even more expensive. So, does the little Murano justify its price? Let us find out. It was immediately clear to me that Cabasse did not cheap out on anything. They pack the Muranos in double boxes. 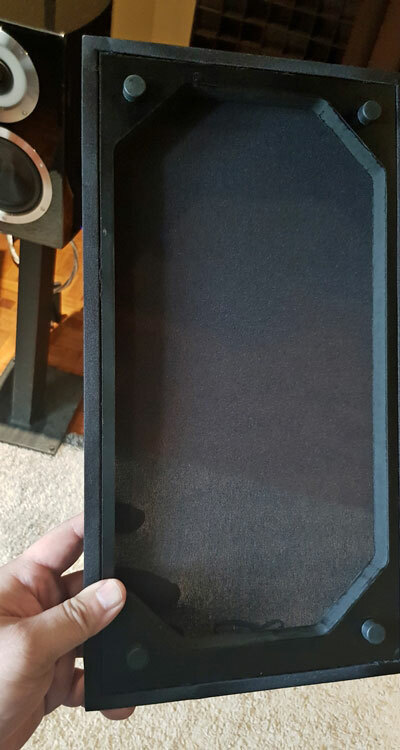 Inside the inner carton are large pieces of white molded foam that protect the speakers from accidental drops and clumsy couriers. On a side note, the inside of the box actually smells good. Not the smell of fresh plastic, varnish or solder, of which I am familiar, rather something similar to perfume. Is it weird that I pointed it out? Perhaps, but the French are known for their perfumes. 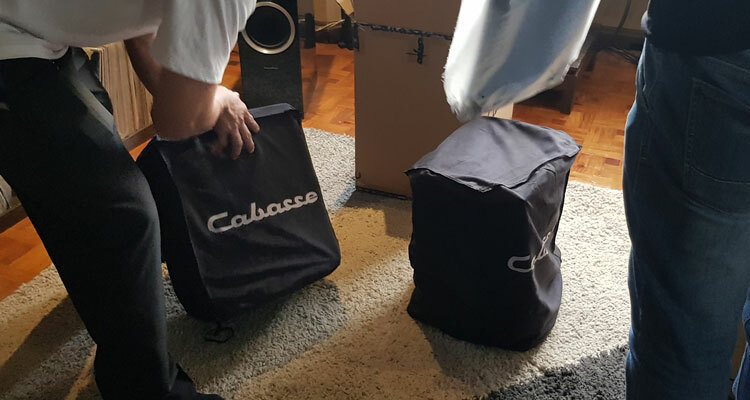 Not that Cabasse deliberately perfumed the Murano, but unboxing it definitely released a fruity fragrance that no other loudspeaker I have reviewed or owned ever has. It made me realize even more that I had just opened something expensive. Remove the top piece and one sees a white plastic bag for the magnetically attached grill and a black cloth that covers the entire loudspeaker. Its texture is similar to eyeglass polishing cloth, or those that come with expensive women’s purses, just a lot thicker. Peek inside the cloth bag and the Cabasse Murano’s high-gloss piano black finish gleams brightly under the room lights. Other finishes include gloss-white and gloss-mahogany. Before taking them out, I first washed my hands “surgeon-style” to make sure I do not accidentally cause stains or scratches. 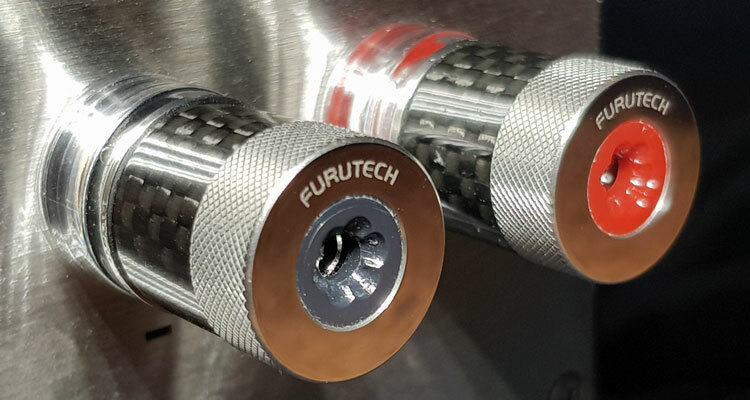 The piano black finish extends underneath where the serial number stickers are and to the back where a pair of chunky Furutech binding posts sit on a brushed metal plate. Just one pair and not two. The Muranos are neither bi-wireable nor bi-ampable. Furutech is a Japanese manufacturer of high-end audio connectors, wire, and accessories. Being a French company, one wonders why Cabasse did not use binding posts of European origin. It doesn’t really matter since these binding posts are of very high quality. They are rhodium-plated and dressed with a carbon fiber inlay. The center holes have either red or black inserts that indicate polarity and accommodate banana plugs. They are also easy to hand-tighten around spade lugs or bare wire. If I had to guess, the Murano’s Furutech posts are probably an OEM version of their model FT-816. 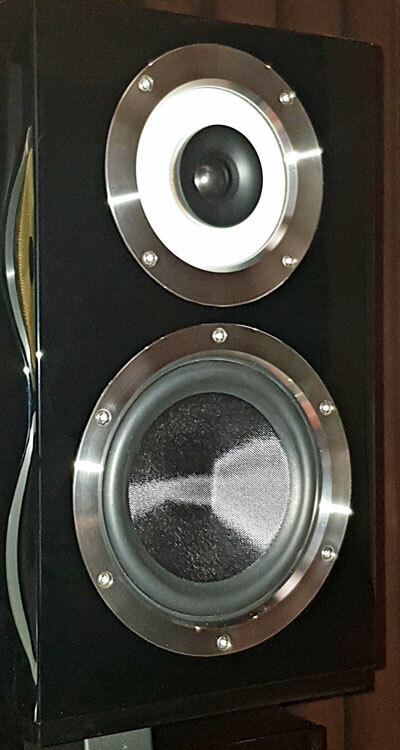 Each speaker measures a little over 15 inches tall, almost 10 inches wide and almost 12 inches deep. They are quite heavy for their size at roughly 30 lbs. each. 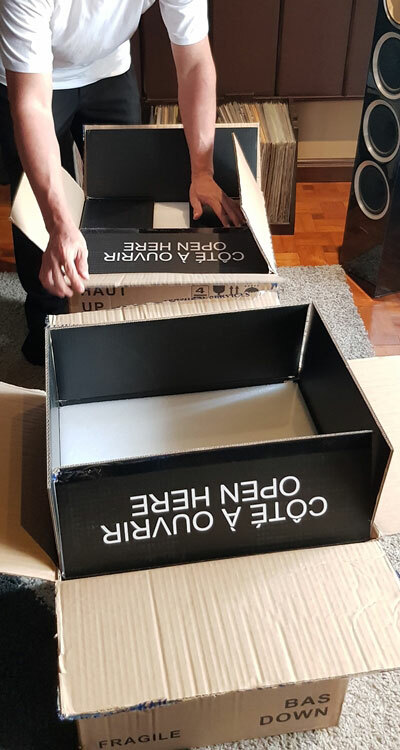 The sidewalls elegantly curve outwards so that sound waves inside the box no longer have as many parallel surfaces on which to bounce on. This reduces distortion while adding rigidity. 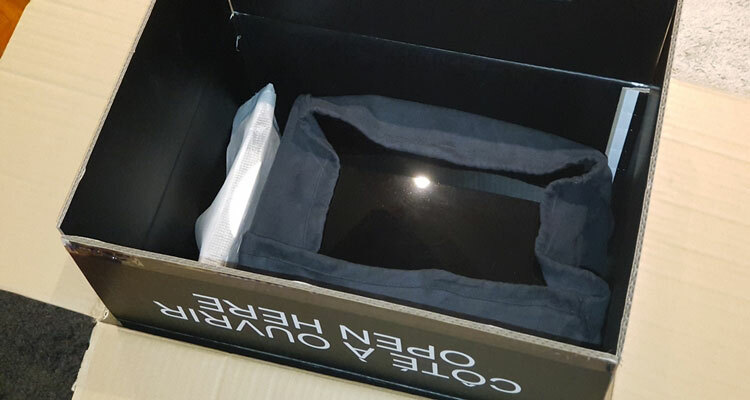 Cabasse knows their gloss black finish attracts dust and fingerprints, so a pair of white cotton gloves are inside the plastic bag that contains the instruction manual. Incidentally, just one of those was provided, which may be because Cabasse sells the Murano as matched pairs. To avoid unsealing that bag, I did not use the gloves. Instead, I made sure my hands were spotlessly clean each time I needed to handle them. Above the binding posts is a specially designed bass reflex port that gently curves downwards into the enclosure. This improves the reproduction of low frequencies, given the Murano’s relatively small enclosure. In addition, the mouth of the port is custom-molded and flares outwards to reduce turbulence, resonance and chuffing noises. These kinds of ports cost more to manufacture than a simple straight tube and only a handful of loudspeaker companies do so. KEF is one of them. Their renowned LS50 loudspeaker uses a similar folded port, flared as it meets the cabinet. Although built like a two-way speaker, the Murano is actually three-way. It has a 6.5-inch woofer and above it, Cabasse’s coaxial midrange and tweeter. The woofer, code-named 17ND36, employs many modern techniques to handle extra power while keeping distortion as low as possible. For example, its basket is cast aluminum its cone is honeycomb laminate. Both provide extra rigidity and stiffness while reducing weight. Its extra-long voice coil moves in an even longer long air gap. Instead of just one magnet, it uses two large ones stacked on top of each other. So large, the magnet diameter is just smaller than the woofer’s mounting hole. In addition, even the pigtail leads from the positive and negative terminals do not merely hang in space before entering the voice coils as they do in most other woofers. Cabasse sews them into the spider to keep them from flopping around and creating their own noise. These techniques cost more but result in a woofer that can get loud while still maintaining composure and smoothness. As a three-way speaker, the woofer does not have to play up to 3 or 4 kHz as they do in most two-way designs. Taking over at a low 800 Hz is the BC13 coaxial midrange and tweeter combo, which is unique in both looks and construction. To better visualize what it looks like, imagine a bagel on a chopping board sliced left to right. The top half is the annular ring. Its voice coil has an unusually wide diameter, also to handle more power and to accommodate a black cast-aluminum waveguide for the tweeter matches its directivity to that of the midrange. The tweeter plays from 3.5 kHz to 24 kHz, well above the range of human hearing. Its 1.1-inch diameter dome is a material called “Kaladex,” a black polyether film from chemical giant DuPont that is stiff, strong and light. Ideal for tweeters. Once again, it is clear that Cabasse put a lot of time and money into developing the BC13 coaxial midrange and tweeter. 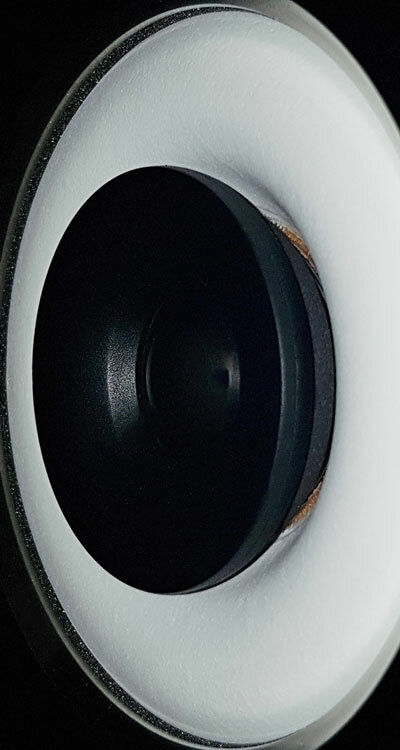 About those colors, a circular black tweeter at the center of a white midrange ring looks just like an eyeball. Without its grills, the Cabasse Murano will stare at you from across the room. Clearly a polarizing design. Some will love it, some will hate it, and some will not mind it at all. Personally, I keep the grills on to avoid any visual distraction and because it sounds better. Again, more on this later. Click on Page 2 for Setup, sound impressions and our verdict!